It was Character Day on March 20, 2014. 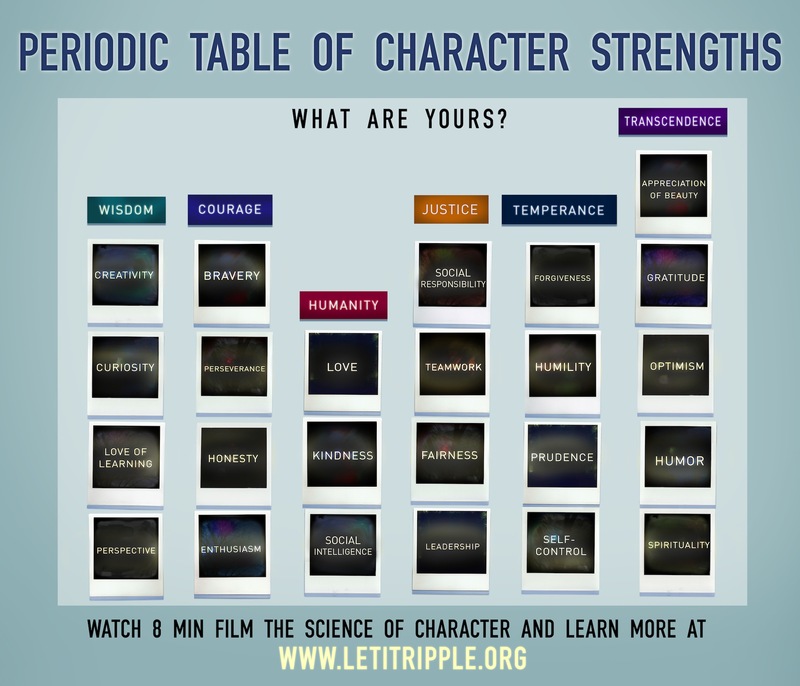 In celebration of, and also to facilitate discussion on character strengths, there was the global cloud film premiere of The Science of Character, “an 8-minute film that explores fascinating new research on character development and our ability to shape who we are” (Let It Ripple website). Directed by Tiffany Shlain, the film promotes the idea that we can cultivate character by building on our strengths, instead of focusing on our deficits. The central organising structure of character is what has been coined a periodic table of character strengths, which is, in fact, fashioned from the VIA Classification of Character Strengths. The classification itself comes out of a landmark publication, Character Strengths and Virtues written by the late Christopher Peterson, one of the founders of positive psychology, and Martin Seligman, Director of the Center and a Professor of Psychology at the University of Pennsylvania. While the table is a neat way of categorising 24 virtues common across cultures and time, the VIA Institute on Character reminds us that character strengths were conceived as “dimensions and not as categories” and that “[p]eople have more-or-less of all the strengths and not simply a set of discrete strengths versus weaknesses” (VIA Institute on Character, para 7). This is an important point to note as the periodic table may lead to an inventory list ticking exercise, thus reinforcing a false dichotomy between what we are and what we’re not. 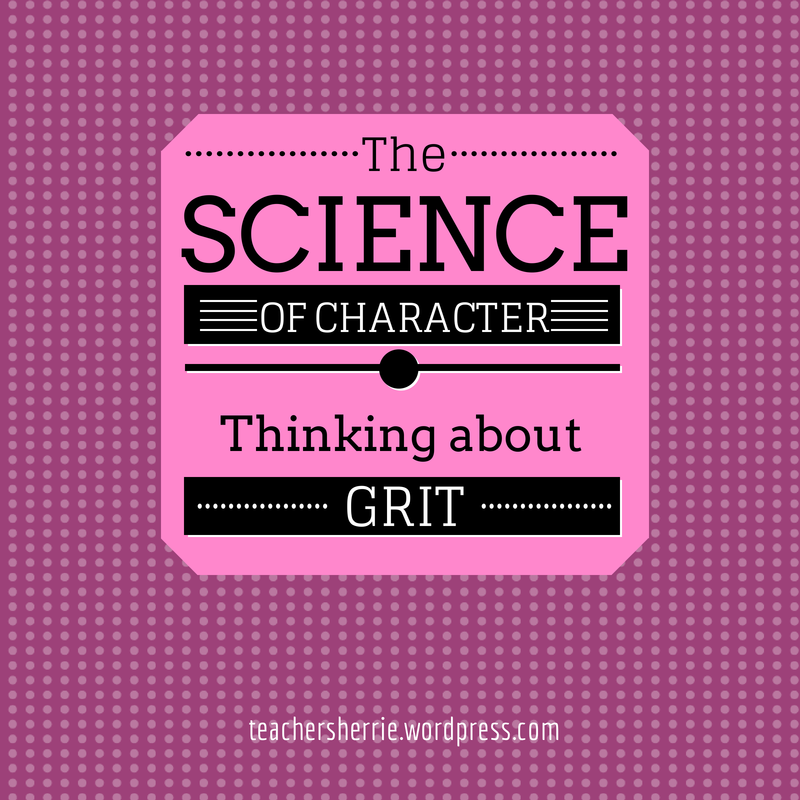 To begin to understand the complexity of the character traits, I started with Grit, a trait I see in myself developing over the years. As part of the film’s premiere, there was a series of Q&A sessions with the experts and I joined a Google Hangouts session featuring Angela Lee Duckworth, the expert on grit and how it contributes to student success. I first came across Angela’s work on TED. Today’s expert chat session on Grit brought up discussions on whether there could be too much virtue, and whether grit could be instilled on demand or something that simply needed time to be developed. To help explain Grit, Angela provided a metaphor of the Christmas Tree where the various levels of goals are hierarchically organised, with the shining star as the highest and unchanging goal underlying Grit. For example, if my highest level goal is providing free education to poor children, my lower level goals could range from studying for a Masters or PhD, setting up projects, and networking. I should be adaptable and flexible with these lower level goals, for example, if I don’t succeed in one project, I can look at starting a new one. However, the overarching goal of free education to the poor does not change. If it did, I wouldn’t be displaying Grit toward my final destination. The Christmas Tree metaphor is helpful in understanding why sudden bursts of energy for short periods of time does not really count toward Grit, but rather, a deep interest that you hold over a period of time does. The fact that Grit requires stamina and patience also means that older people will exhibit Grit more often than younger people. I look back on my twenty-something self and see several bursts of energy and nothing close to Grit. Comfortably into my thirties, I have discovered what I’m passionate about and Grit will serve me for the long run. Character Day may have come and gone but let the Character Conversation continue, with experts, with each other, with yourself. Peterson, Christopher, and Martin E. P. Seligman. Character Strengths and Virtues: A Handbook and Classification. Washington, DC: American Psychological Association, 2004. Print. Shlain, Tiffany & The Moxie Institute Films. “The Science of Character (a New 8 Min “Cloud Film”).” YouTube. YouTube, 20 Mar 2014. Web. 20 Mar. 2014. TED. “Angela Lee Duckworth: The Key to Success? Grit.” YouTube. YouTube, 09 May 2013. Web. 20 Mar. 2014. VIA Institute on Character. “Guidelines on Use and Interpretation.” VIA Character Use and Interpretation. N.p., 2014. Web. 20 Mar. 2014. http://www.viacharacter.org/www/en-us/viainstitute/useandinterpretation.aspx.